All over the world, cases of depression go undiagnosed. It is very important to seek medical attention as soon as you start to notice that you don’t feel like yourself. With the depressive symptoms being so varied, it is crucial to seek help before your depression worsens. Light therapy is something that can help treat many types of depression and it doesn’t require a prescription because there are very few possible side effects (ex. a headache or eye strain). How it works: the light from a light box enters through your eyes and creates a chemical reaction that causes your brain to produce serotonin. Serotonin is nicknamed the ‘Happy Chemical’ because it is what helps give us energy and put us in a good mood. Since you only use it for 30 minutes each day, a light box is the perfect natural treatment for depression – especially seasonal depressions like Seasonal Affective Disorder (SAD). 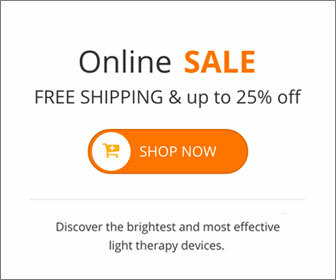 Even though light therapy is a virtually risk free natural therapy for depression, it is still always the best option to seek medical advice for depression from a professional. This entry was posted on Thursday, September 21st, 2017 at 11:05 am	and is filed under Depression, Light Therapy. You can follow any responses to this entry through the RSS 2.0 feed.